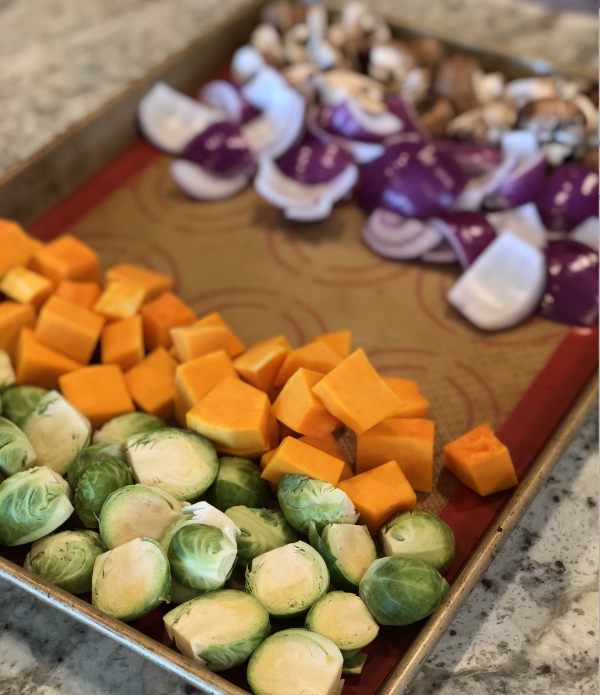 Fall Vegetable Medley…The Perfect Side Dish! 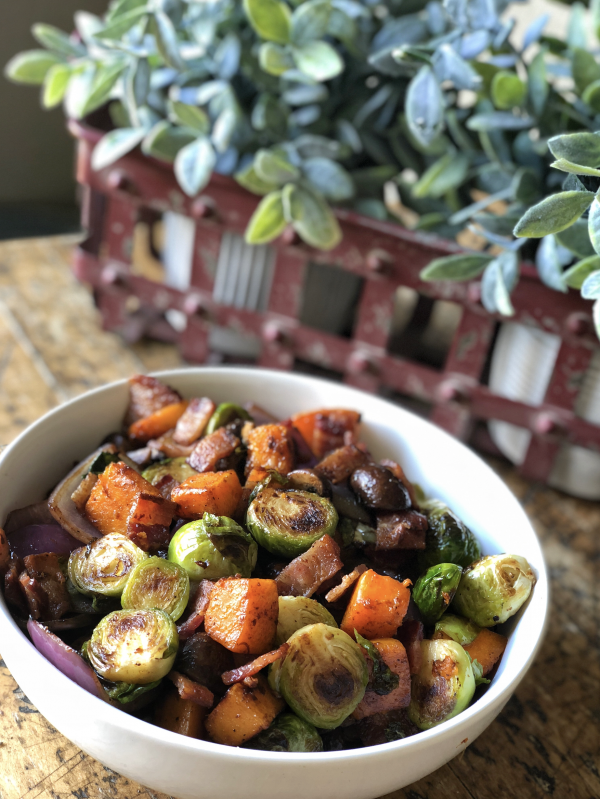 If you are looking for something to complement fall and its flavors, this side dish will do it perfectly! 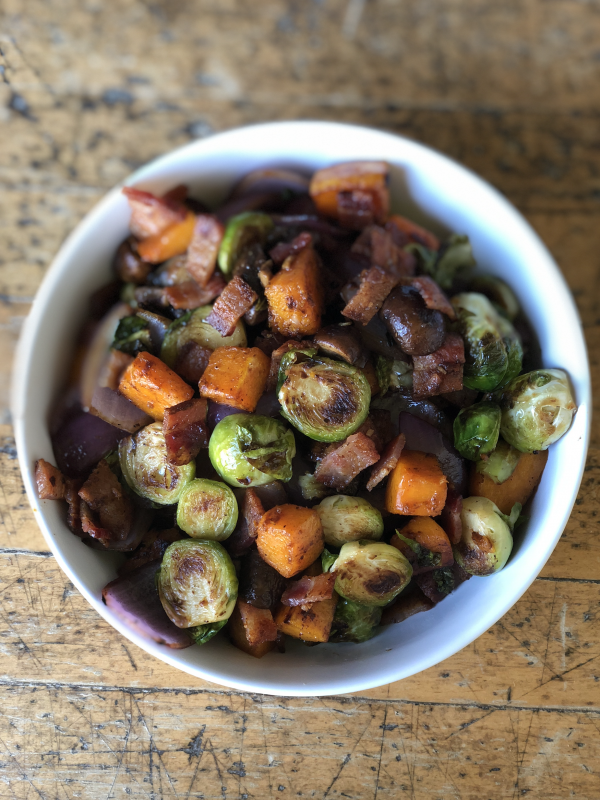 This is by far one of my favorite fall side dishes, and so festive to make. Lets start out by placing a large skillet over medium heat. We are going to cook our bacon and set it aside. While your bacon is cooking, lets prep our veggies. Trim back the outer brussel sprout leaves and then cut in half. Half a butternut squash, peel the outside skin, and scoop the seeds from the center with a spoon. Cut the squash into cubes (***TIP: you can always buy butternut squash peeled and seeded at the grocery store to save time). Wipe the mushroom caps off with a damp paper towel and then half. Peel and dice you garlic. Finally, cut your onion into wedges to give you about 1 inch pieces of onion. Now that your veggies are prepped and I'm sure bacon has cooked; use the same pan to sauté the veggies. Remove all bacon grease except 3 Tablespoons. Add brussel sprouts and butternut squash to the pan. 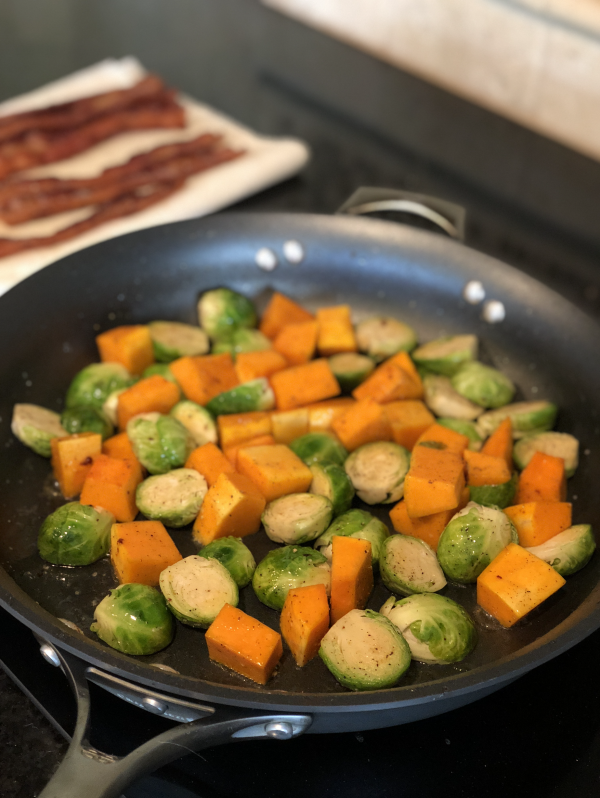 Season your sprouts and squash with nutmeg, salt, and pepper (a good pinch of salt and pepper throughout this recipe is what I use to season veggies). Sauté for about 8-10 minutes or until the squash is fork tender. Once fork tender remove veggies and place in a separate bowl. To the sauté pan add mushrooms and onions. If the pan seems a little dry add a tab of butter or drizzle two T of olive oil. 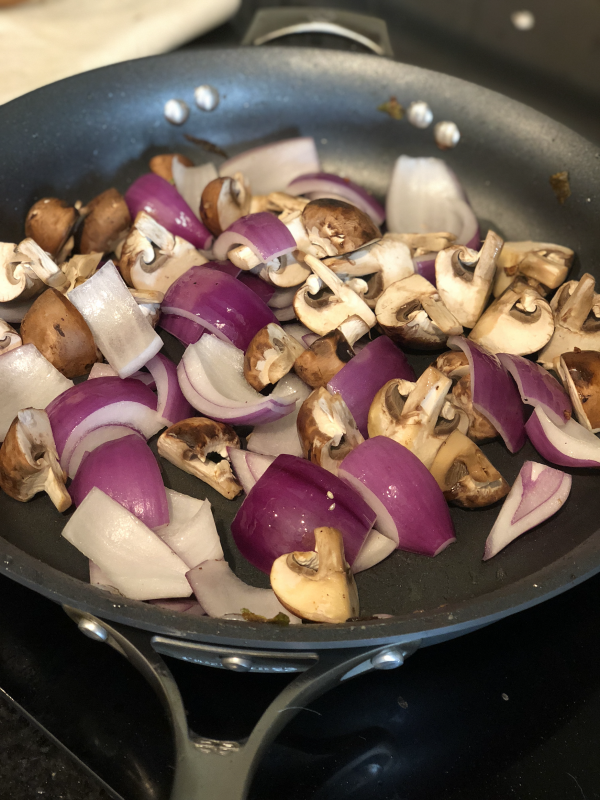 Sprinkle salt and pepper over the shrooms and onions, and sauté for 4-5 minutes or until mushrooms are browned and onions are tender. When the mushrooms are done stir in an additional pinch of salt and pepper along with the minced garlic. Stir and combine everything well. Add mushroom mixture to squash mixture. Dice up your bacon; add that to the veggie mixture. Top the veggies with pumpkin seeds to add extra flavor. There you have it, the perfect fall side dish. This is a great side dish with chicken or pork. It isn't fancy but brings a ton of fresh flavor to your table!! Enjoy!! !